But We Don't Need 864 Hand Towels! Few people would dream of heading to bed without a comfortable pillow. Even when traveling away from home, a pillow is an iconic reminder of comfort and relaxation. Pillows have had a long history and span many cultures, but they haven’t always been soft. Hard wooden pillows have even been found in the tombs of mummies. While those may be easy to clean, they can’t be very comfortable! Over the ages, pillows have been filled with many materials such as straw and buckwheat. These materials could be easily be replaced and refilled but are not nearly as high quality as modern stuffing such as cotton, feathers or polyester filling. These more modern materials are not as easily replaced, and frequent washing can wear down pillows especially in situations that require frequent laundering such as a hotel, hospital, or school. A pillowcase is the best solution for pillow hygiene in multi-user situations. Special hypoallergenic pillow protectors often have a zippered closure to fully encase and protect the pillow. When ordering pillowcases in bulk, they are standardized in accordance to bed sizes and often come in three common sizes. A standard pillowcase is 20 inches by 26 inches (51 cm × 66 cm). Queen sized pillowcases are 20 inches by 30 inches (51 cm × 76 cm). King sized pillows require a pillowcase measuring 20 inches by 36 inches (51 cm × 91 cm). Pillowcases also have a couple different styles of opening. The most common is the bag style which is sewn on three sides and open on a short side to allow the pillow to be put in and out. This is a good feature in situations where pillowcases are frequently changed and many pillowcases are on hand. Some pillows are sewn along all four sides and instead have a slit down the back to remove the pillow. These are often decorative pillowcases and are not meant for sleeping. Decorative pillowcases and shams can be an easy way to change decor and dress up a space, but the classic white pillowcase is more versatile. 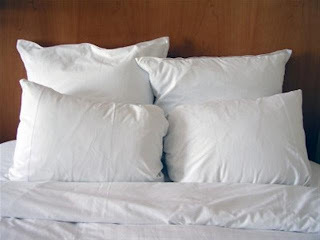 White pillowcases are easily bleached and reassuring clean. When there is a need for bulk pillowcases, white is easy to mix and match and can put visitors and guests at ease, as it is visually hygienic. Some people find cotton pillowcases to be the most comfortable as they absorb sweat; however, cotton can wrinkle considerably in the wash. Satin pillowcases are useful for keeping hair in place and not waking up with bed head. Other fabrics frequently used for pillowcases include cotton-poly and microfiber fabrics. If bulk pillowcases are needed a fabric such as microfiber is easily washed, less apt to wrinkle and still soft to the touch. No matter what style, size or fabric a pillowcase is made off, it still spans time and culture as a creature comfort and requirement for restful sleep.